Formatting a document with the many tools offered in Word 2011 for Mac is a piece of cake. You can make a document look however you need it to look. Just follow these tips to adjust the spacing between lines and paragraphs. To change the spacing between lines, select the lines whose spacing you want to change, or simply put the cursor in a paragraph if you’re changing the line spacing throughout a paragraph (if you’re just starting a document, you’re ready to go). Then, on the Home tab, click the Line Spacing button and choose an option on the drop‐down list. or other unusual text. Word adjusts the lines but makes sure there is, at minimum, the number of points you enter in the At box between each line. Exactly: Choose this one and enter a number in the At box if you want a specific amount of space between lines. Multiple: Choose this one and put a number in the At box to get triple‐spaced, quadruple‐, quintuple‐, or any other number of spaced lines. To quickly double‐space text, select the text and press Command+2. Press Command+5 to put one and a half lines between lines of text. Press Option+Command+M to open the Paragraph dialog box. 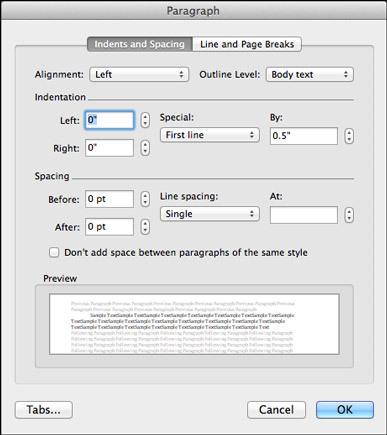 Rather than press Return to put a blank line between paragraphs, you can open the Paragraph dialog box and enter a point‐size measurement in the Before or After text box. To open the Paragraph dialog box, press Option+Command+M. The Before and After measurements place a specific amount of space before and after paragraphs. The Don’t Add Space between Paragraphs of the Same Style check box tells Word to ignore Before and After measurements if the previous or next paragraph is assigned the same style as the paragraph that the cursor is in. Truth be told, the Before and After options are for use with styles. When you create a style, you can tell Word to always follow a paragraph in a certain style with a paragraph in another style. For example, a paragraph in the Chapter Title style might always be followed by a paragraph in the Chapter Intro style. In a case like this, when you know that paragraphs assigned to one type of style will always follow paragraphs assigned to another style (remember that any line that ends with a Return is considered a paragraph), you can confidently put space before and after paragraphs. But if you use the Before and After styles indiscriminately, you can end up with large blank spaces between paragraphs.